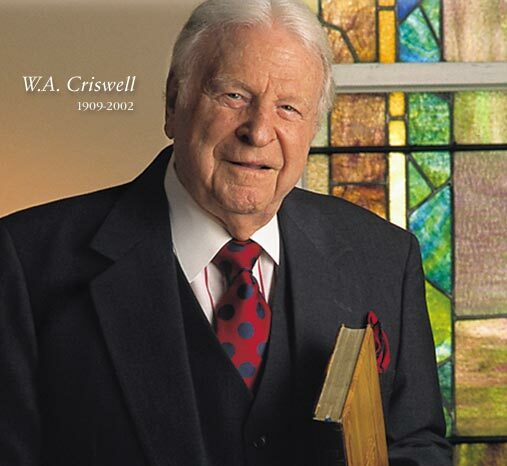 After reading through some sermons today by the late Southern Baptist pastor and statesman, W. A. Criswell, I could not help but wonder if he would attach his name to the recent statement that Jerry Vines, Paige Patterson, David Hankins, Emir Caner and others have issued and signed. Of course, all we can do is speculate, but it might be worth reading his thoughts on some of the very doctrines that these brothers have addressed in their statement. Since I won’t be continuing my interaction with the statement until next week, I thought you would enjoy looking at a couple of his sermons that touch on pertinent subjects at hand. That’s our God! Now that’s what you call foreordination. That’s what you call predestination! That’s Calvinism! And I am a Calvinist. That’s good old Bible doctrine, and I believe the Bible! These things are in God’s hands, and ultimately and finally, He purposed it and executeth all of it! There is a general call, but there is also an effective call. In the great general call, most of them did not respond, most of them did not hear, most of them did not believe, most of them did not come; but always some came, some heard, some were saved—the effectual calling of God. I read in Acts 13, verse 48, “When the Gentiles heard this, they were glad, and glorified the Word of the Lord: and as many as were ordained to eternal life believed.” I turn the page again, and I read in 2 Thessalonians chapter 2, “Brethren beloved, because God hath from the beginning chosen you to salvation, whereunto He called you by our gospel.” There is an effectual call. There are those who listen. God opens their hearts. God speaks to them, and they hear their name called, and they respond; the effectual calling of the elective choosing Spirit of the Lord. It is an interesting study to compare these expressed convictions of this godly, influential Southern Baptist giant with those commended in the affirmation and denials of recently released statement.